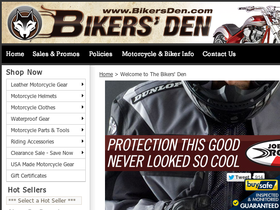 The Bikers' Den, online at BikersDen.com, is your destination for motorcycle gear and accessories. The Bikers' Den sells leather motorcycle jackets, motorcycle helmets, leather motorcycle vests, holster shirts, sunglasses, and leather motorcycle boots. The Bikers' Den also carries motorcycle face masks, leather riding gloves, luggage racks, motorcycle passenger backrests, waterproof motorcycle saddlebags, tool bags, belt bags, and motorcycle caps. You can find motorcycle headlights, biker belt buckles and belts, mounted clocks, and children's leather jackets and vests at The Bikers' Den as well. RetailSteal.com has the best Bikers' Den coupon codes, Bikers' Den discounts, Bikers' Den coupons, and Bikers' Den promo codes. Shipping and handling rates at The Biker's Den depend on the pricing of your purchase and your shipping destination. Free shipping is offered for orders over $200. See website for full details, exclusions may apply. Spend $500 or more at Bikers' Den and use this coupon code to save 15% on your entire order of $750 or more. Click to save. Get free shipping on orders over $200 when shopping online. Click to save. Shop Bikers' Den and receive $25 Biker Bucks towards your next purchase when you spend $250+. Use coupon and save 20% at Bikers' Den with your leather vest purchase $1100+. Head over to Bikers' Den and save 15% on your leather vests purchase $750+. Click to shop and use coupon code to save. Act now and save 10% off bags from BikersDen.com with this coupon code. Use this coupon code on Bikers' Den to save 10% on your purchase of Daytona helmets. Shop online at BikersDen.com and enjoy up to 40% off a wide range of biker apparel and accessories. Get a pair of fingerless, leather gloves for free with your purchase of any leather jacket, vest, or chaps from Bikers' Den. Click link to shop and save.